Dodona is definitely the most significant ancient town of Epirus visited daily by many tourists from all around the World. 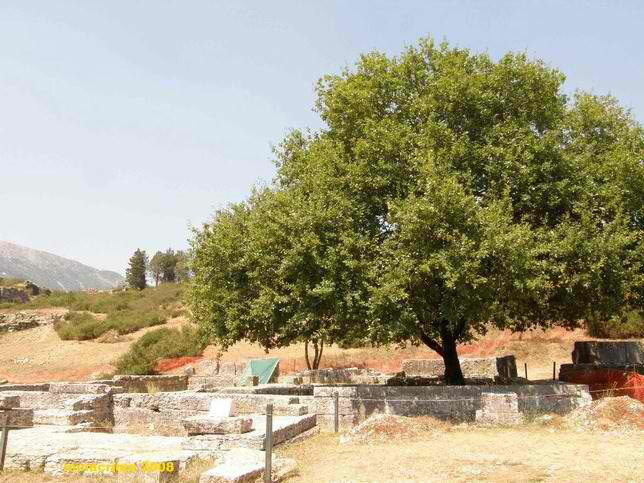 Dodona was a very important town thanks to its oracle devoted to a Mother Goddess identified at other sites with Rhea or Gaia, but here called Dione, who was joined and partly supplanted in historical times by the Greek god Zeus. The shrine of Dodona was regarded as the oldest Hellenic oracle, possibly dating to the second millennium BCE according to Herodotus. Situated in a remote region away from the main ancient Greek towns, it was considered second only to the oracle of Delphi in prestige. Priestesses and priests in the sacred grove interpreted the rustling of the oak leaves to determine the correct actions to be taken. Aristotle considered the region around Dodona to have been part of Hellas (Greece) and the region where the Hellenes (Greeks) originated. The oracle was first under the control of the Thesprotians before it passed into the hands of the Molossians. It remained an important religious sanctuary until the rise of Christianity during the Late Roman era. Though the earliest inscriptions at the site dates to 550–500 BCE, archaeological excavations over more than a century have recovered artifacts as early as the Mycenaean era. Many artifacts are now at the National Archaeological Museum of Athens, and some in the archaeological museum at nearby Ioannina. Archaeologists have also found Illyrian dedications and objects that were received by the oracle during the 7th century BCE. Until 650 BCE, Dodona was a religious and oracular center mainly for northern tribes: only after 650 BCE did it become important for the southern tribes. At Dodona, Zeus was worshipped as "Zeus Naios" and originally an oracle of the Mother Goddess, the oracle was shared by Dione and Zeus. Many dedicatory inscriptions recovered from the site mention both "Dione" and "Zeus Naios". Elsewhere in Classical Greece, Dione was relegated to a minor role by classical times, being made into an aspect of Zeus's more usual consort, Hera, but never at Dodona. In Homer's Iliad (circa 750 BCE), Achilles prays to "High Zeus, Lord of Dodona, Pelasgian, living afar off, brooding over wintry Dodona". No buildings are mentioned, and the priests slept on the ground with unwashed feet. The oracle also features in Odysseus's fictive yarn about himself told to the swineherd Eumaeus: Odysseus, he tells Eumaeus, has been seen among the Thesprotians, having gone to inquire of the oracle at Dodona whether he should return to Ithaca openly or in secret (as the disguised Odysseus is actually doing). Odysseus later repeats the same tale to Penelope, who may not yet have seen through his disguise. His words "bespeak a familiarity with Dodona, a realization of its importance and an understanding that it was normal to consult Zeus there on a problem of personal conduct." 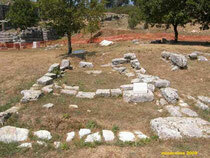 Not until the 4th century BCE, was a small stone temple to Zeus added to the site. By the time Euripides mentioned Dodona and Herodotus wrote about the oracle, priestesses had been restored. Though it never eclipsed the Oracle of Apollo at Delphi, Dodona gained a reputation far beyond Greece. In Apollonius of Rhodes' Argonautica, a retelling of an older story of Jason and the Argonauts, Jason's ship, the "Argo", had the gift of prophecy, because it contained an oak timber spirited from Dodona. In 290 BCE, King Pyrrhus made Dodona the religious capital of his domain and beautified it by implementing a series of construction projects (i.e. grandly rebuilt the Temple of Zeus, developed many other buildings, added a festival featuring athletic games, musical contests, and drama enacted in a theatre). A wall was built around the oracle itself and the holy tree, as well as temples to Heracles and Dione. 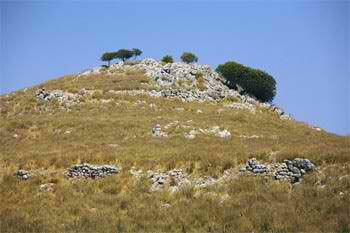 In 219 BCE, the Aetolians, under the leadership of General Dorimachus, invaded and burned the temple to the ground. 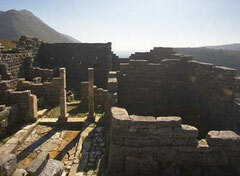 During the late 200s BC, King Philip V of Macedon reconstructed all the buildings at Dodona. 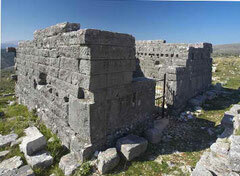 In 167 BCE, Dodona was destroyed by the Romans but was later rebuilt by Emperor Augustus in 31 BCE. 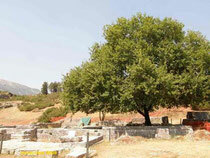 By the time the traveller Pausanias visited Dodona in the 2nd century CE, the sacred grove had been reduced to a single oak. In 241 CE, a priest named Poplius Memmius Leon organized the Naia festival of Dodona. In 362 CE, Emperor Julian consulted the oracle prior to his military campaigns against the Persians. Pilgrims still consulted the oracle until 391-392 CE when Emperor Theodosius closed all pagan temples, banned all pagan religious activities, and cut the ancient oak tree at the sanctuary of Zeus. Situated the region of Epirus, on the northwestern side of which lies the present day village of Mesopotamos, is the most important and most ancient Oracle of the Dead of Antiquity, the Nekyomanteion of Acheron. It was here that the ancients located the Gates of the Underworld which led to the kingdom of Hades (Pluto), who ascended to the Upper World only to abduct the beautiful Persephone. Charon, the ferryman of Hades carried dead souls across the Acheron river to the entrance of Hades, after having received a coin which was placed in or on the mouth of the dead by their relatives to pay for passage. Upon entering the Underworld, the souls presented themselves to the four judges, Pluto, Minos, Rhadamanthys and Aeacus who decided over their deeds during their life on earth. Only few mortals managed to descend to Hades alive and come back to life again. The cunning Odysseus, as related by Homer in the Odyssey, was the first one who, following the advice of the sorceress Circe, succeed in entering to collect the relevant information that would help him to return to Ithaca and returned alive. This difficult endeavor, according to mythology, was also attempted by Hercules, Theseus and Orpheus, the king of Thrace, who tried to bring his wife Eurydice back. The main sanctuary is rectangular with 22 m long sides. It comprises the main hall, corridors and reception rooms, and for the staff, preparation rooms, storing rooms where clay jars with visitors' offerings have been preserved, the labyrinth and the actual sanctuary where the oracles were given. The oracle, known to everyone of Hellenic origin since Homer's epoch, was burnt down and destroyed by the Romans in 167 BC. After its destruction, the courtyard was inhabited again in the first century BC. In the eighteenth century the Monastery of Agios Ioannis Prodromos (Saint John the Baptist) was built upon the ruins of the Oracle, the primary temple which still stands upon the ruins. Nicopolis — or Actia Nicopolis — was an ancient city of Epirus, founded 31 BC by Octavius Augustus in memory of his victory over Mark Antony and Cleopatra the previous year. It was later the capital of Epirus Vetus. It is on the west coast of Greece. In the aftermath of the battle of Actium in the Ambracian Gulf in 31 BC, Octavius Augustus himself founded Nicopolis, the city of victory, in 28 BC, symbolically representing his successful unification of the Roman Empire under one administration and, geographically, a major transportation and communications point linking the eastern and western halves of the Mediterranean. On the spot where Octavius Augustus own tent had been pitched he built a monument adorned with the beaks of the captured galleys; and in further celebration of his victory he instituted the so-called Aktian games in honor of Apollo Aktios. 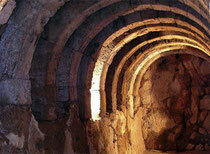 The city proved highly successful, and it was considered the capital of southern Epirus and Akarnania. Among other things, it obtained the right to send five representatives to the Amphictyonic Council. During the first five years or so of the city's foundation, local authorities supervised the construction of the city walls, the majority of the public buildings, including the odeion and the aqueduct. The city's south gate was connected by a road to the Ionian harbor Komaros. From around 460 in Nikopolis was a construction of a series of six basilicas, beginning with the five-aisled metropolitan basilica B.
Artisans of Nikopolis decorated many of the city's basilicas with some high-quality mosaics, developing their own workshop, operating until the 550s, whose influence extended to the rest of Epirus and perhaps further afield in eastern Illyricum. Basilica B was the largest of the Nicopolis basilicas and probably served as the metropolitan bishop’s main church. An inscription informs us that Bishop Alkison (491-516) sponsored some additions to the southern annex of Basilica B, possibly around 500. Evidently the walls of Nikopolis built in the time of Augustus were not for defensive purposes, or at least were not functioning in 474, since the Vandals took the city apparently without being equipped with siege weapons, in view of the fact that they failed to take the walled city of Tainaros. If this is true, then the so-called Justinian walls of Nikopolis, enclosing only one-sixth of the city founded by Augustus, were erected not before 474. In any case, the Nikopolis walls, probably built sometime in the 480s-510s period (like the walls of Dyrrachion), were made of bricks, mortar, and rubble. Around 500, as mentioned, Bishop Alkison of Nikopolis (491-516) supervised the addition of annexes to five-aisled metropolitan basilica B, which has taken his name. Around 515, in Nikopolis, construction of the three-aisled basilica Δ, with fragments of floor mosaics. Around 555, according to Procopius, Emperor Justinian (527-565) renovated the fortifications of Nikopolis, as part of his huge program involving the renewal of city fortifications and the erection of new defences. Also the beginning of construction of the three-aisled Basilica Α decorated with an extensive series of extant floor mosaics. Bishop Doumetios I of Nikopolis also made some additions to Basilica B, also to the construction of the three-aisled basilica Ε, near the southern harbor Magaronas. Around 575, in Nikopolis, construction of the three-aisled basilica Γ and completion of Basilica Α under Bishop Doumetios II. 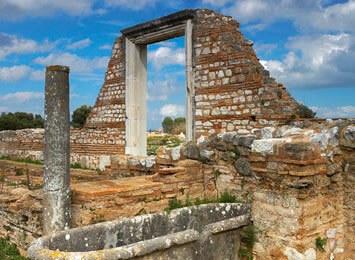 In the course of the Middle Ages Nikopolis was supplanted by the town of Preveza. The ruins of Nikopolis, now known as Palaia Preveza ("Old Preveza") lie about 3 miles north of that city, on a small bay of the Gulf of Arta (Sinus Ambracius) at the narrowest part of the isthmus of the peninsula which separates the Gulf from the Ionian Sea. 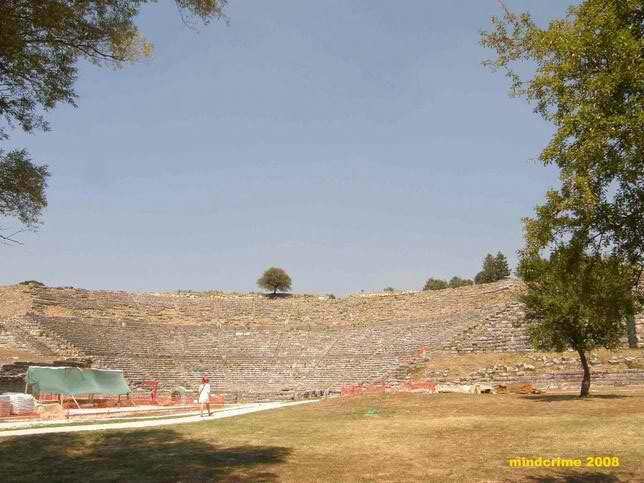 Besides the Acropolis, the most conspicuous features are two theatres (the larger with 77 rows of seats) and an aqueduct which brought water to the town from a distance of 27 miles. It continued under Roman and later Byzantine rule, experiencing three brief periods of Bulgarian rule in the 10th century. 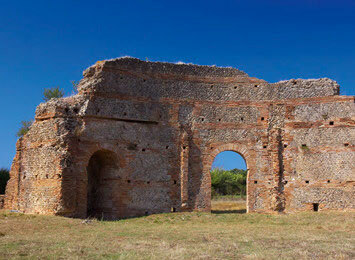 In 1798 French Revolutionary troops, stationed in Preveza by Napoleon, dug into the graves and ruins of ancient Nicopolis and looted various treasures. These were later taken by the troops of Ali Pasha who defeated the French and their Greek allies. Various battles fought in this area, the latest one in 1912 when it was captured by the Greek Army during the First Balkan War, were named "Battle of Nicopolis" rather than "Battle of Preveza". Cassope was an ancient Greek city in Epirus, today in the Preveza regional unit. Cassope is situated on the south-east slopes of the Zalongo mountain, near the village of Kamarina. 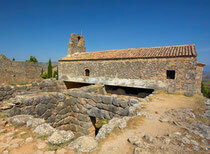 It is built on the edge of a cliff, which dragged down a part of the site when it collapsed. 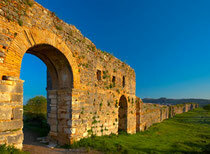 It is considered one of the best remaining examples of a city built along the lines of a Hippodamian plan in Greece. First settlements on site are known from the Paleolithic, however the prominent city of Cassope was founded in the middle of the 4th century BC and served as the capital of the Cassopaeans, a sub-tribe of the Thesprotians. It belonged to the Aetolian League. It flourished in the 3rd century BC, when large public buildings were built. Cassope also minted its own coins. 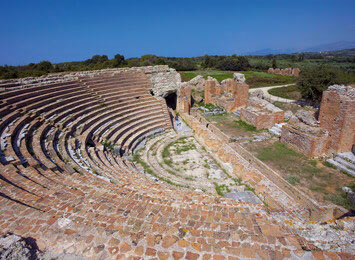 It was destroyed by Roman forces in 177-176 BC and Cassope was abandoned in 31 B.C. when the remaining inhabitants resettled to Nikopolis. The ruins of Cassope were visited and described by William Martin Leake in the early 19th century. Extensive excavations were performed by a Greek team under Sotiris Dakaris in 1952 and 1955, and in 1977-1983 by a team from the University of Ioannina together with the German Archaeological Institute, co-led by Dakaris, Wolfram Hoepfner, Konstantina Gravani, and Ernst-Ludwig Schwandner. A site mentioned by Homer, Ephyra, a Mycenaean colony, is located on a hill 500 m north of the Necromanteion (the place today called Mesopotamos) in region of Epirus. 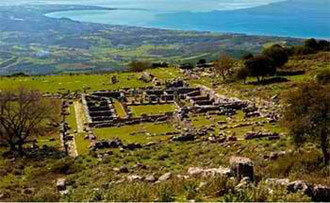 As early as the fourteenth century BC, Mycenaean traders founded a colony on this and other spots on the west coasts of Epirus, with the aim to facilitate commercial contacts to the Epirotan inner land and mainly to exploit its abundant livestock. There is no doubt regarding its location by the Acheron River and the Acherusia Lake, since it is also referred to by the historian Thucydides some centuries later in the description of the anchoring of the Corinthian fleet and their allies in this area before the naval battle against Corcyra at Syvota. The great historian narrates that: “[...] at some distance from the sea, in that part of Thesprotia called Eleatis, lies the city of Efyra, near which the Acherusian lake finds a way out to the sea; the river Acheron whence the name is derived, flows through Thesprotia and falls into the lake”. Besides this important written source, findings on the hill, on which the Necromanteion was built later during the Hellenistic period, confirm human presence already there already since the Late Bronze Age. Three box-shaped infant graves which were found in the courtyard of the Hellenistic temple, potsherds and a bronze sword which were found on the hilltop date back to exactly this period: 13-14th century BC. This evidence would clearly have been much more abundant if the hilltop had not been flattened for the construction of a vast Hellenistic sanctuary that destroyed all previous evidence. The settlement of Orraon, cradle of the Molossian tribe, was founded shortly before mid-fourth century BC with a view to controlling the pass from the Ambracian Gulf to the Epirote inner land(in prefecture of Preveza, region of Epirus). It was built on a low hill on the west foothill of Xirovounio next to the present day settlement of Kastri Gymnotopou, with an excellent view of every point on the horizon and especially the flat coastline of the Ambracian Gulf. In 168 BC the city made a stand against the roman legions but paid the price as its fortifying wall fundamentally destroyed. Nevertheless, its inhabitance continued until 31 BC after which its inhabitants were forced to install themselves at Nicopolis. The strategic position of the city, its natural fortification to the south, together with a wall fortified with towers and narrow pathways surrounding it on the accessible sides of the hill, a supply of water tanks as well as an absence of places of common use all attest to the settlement's special character as a fortress. Its city plan was based on the Hippodamian system (created by the architect Hippodamus of Miletus), following the pattern of the neighboring city of Amvrakia, consists of narrow parallel streets, stretching in a north-south direction, intersected by two streets at right angles, lying east-west, thus forming long and narrow building blocks. The narrow side of each block, which is 15 m wide, constitutes the construction of one residence. This diverges from the known examples of other cities of the fourth century BC (obviously due to the small size of the settlement). All houses are built entirely of stone, using local resistant limestone, which has led to the exceptional and rare preservation of some of them up to the second floor. 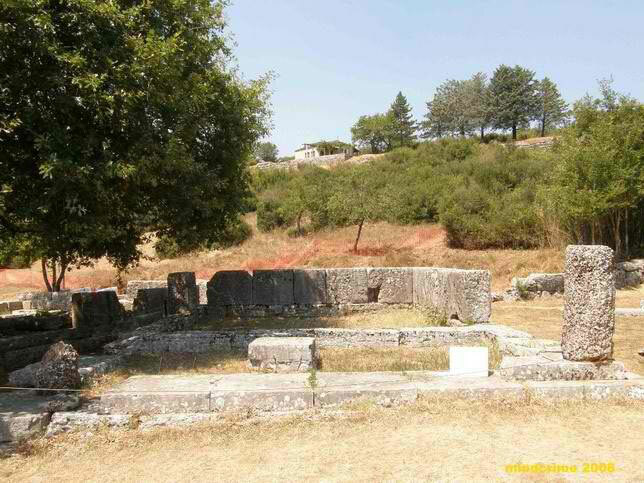 Kikkinopelos, an open-air area located close to the Louros River and the settlement of Agios Georgios on the Preveza-Ioannina national road, constitutes perhaps the most ancient archaeological site so far not only of Epirus but of entire Greece. Besides its momentous historical background, it impresses through its characteristic color as well as the corrosion sustained over time by rainwater. It remains unclear still when and how it was formed. As it was situated on one of the main natural passes close to the abundant waters of the Louros River and offered plenty of game for food and clothing, it attracted prehistoric humans quite early on in history. A stone hand axe found in recent years, (one of the few examples of the Helladic area) which dates back 250,000-200,000 years, along with some other indications to the area’s date - as yet unconfirmed since they do not come from excavation evidence - lead us to the Lower (most ancient) Paleolithic period. The indications for the subsequent eras, the Middle and Upper Paleolithic (200,000-10,000 to date), are clearer, as survey work and excavation on the site have revealed several stone tools which incontestably proves its inhabitation during the above mentioned period of time. 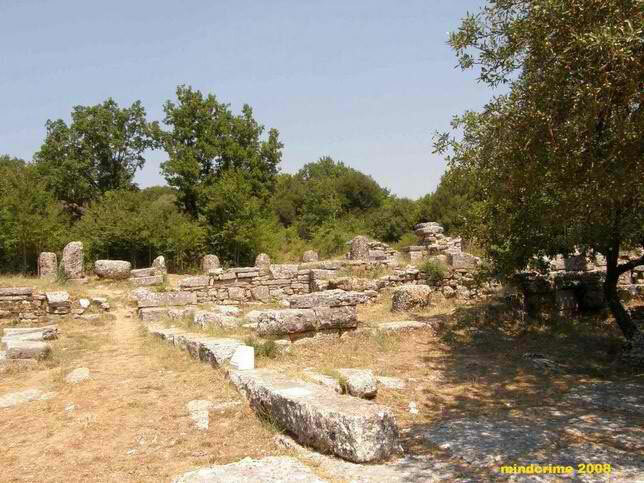 It is believed that it was inhabited by the same group or groups who dwelled in Asprochalico and some more sites in the valley of Louros. However, it cannot yet be determined whether this location, which is also the largest in the area, constituted the main location for seasonal settlement, or if its role varied in relation to climate changes. 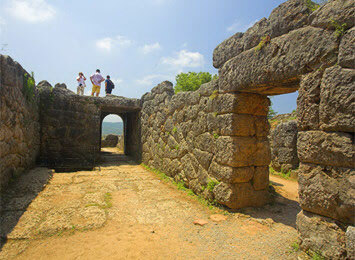 In any case, Kokkinopelos constitutes one of the few sites of the Helladic area which is related to the transition from Neanderthal to modern populations. It remains to be determined how this transition occurred and how modern humans, Homo sapiens, managed to prevail over them. 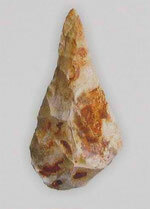 From some leaf-shaped spearheads found here, which are considered to be their tools, it has emerged that Homo sapiens crossed the Helladic region on their way from the Near East to Western Europe. Nevertheless, since there are no skeletal remains (the reddish soil’s composition did not contribute to their preservation), it is hard to say with certainty to what species the groups who inhabited both this and other areas of Epirus belonged to.